Best picture? “Argo.” Best director? Spielberg. Best actress? Jennifer Lawrence. Best screenplay? “Django Unchained.” At least that’s the way it stands today, Feb. 20, according to Microsoft researcher David Rothschild, who, after correctly predicting President Obama’s victory in February 2012 — 9 months before the actual election — is applying his prediction modeling to the Oscars. 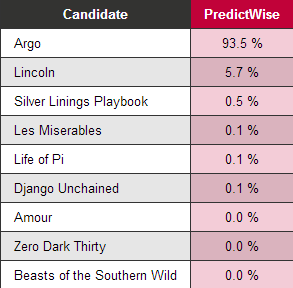 Take a look at all of Rothschild’s Oscar predictions at his PredictWise blog, and for some insight regarding his approach, check out the Microsoft Research “And the Oscar goes to….” blog post. I have no predictions to make, but I’ve always been partial to the technical categories like cinematography, screenwriting, and especially editing, which for me is the third and final phase of screenwriting; the first phase is the actual writing of the script, but then the actors and director do a bit of rewriting during production, and then, finally, in the editing room, a skilled editor can enhance a story even further. This is my favorite time of year for films because, not only are the best films in theaters or already available to buy or rent, but the cable channels are featuring Oscar-winning films from previous years, so happy viewing, everyone.